Individual Poverty Rates These traditional poverty rates show the percentage of individuals in poverty. Family Poverty These data paint a broader picture of life in poverty, with special emphasis on the family unit. This provides an alternative perspective to the standard poverty rate, which reveals only individuals in poverty. 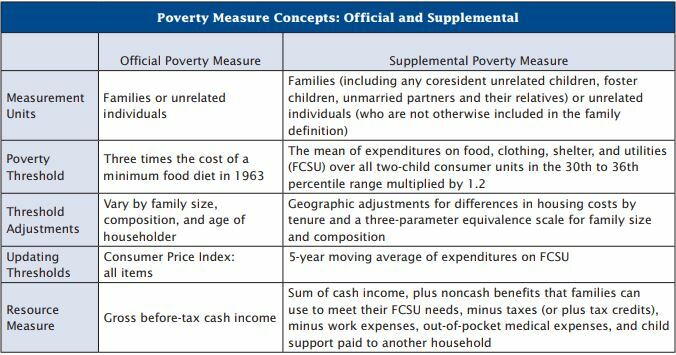 Establishing Poverty This section is a review of how poverty is established by the U.S. Census Bureau. Illinois Poverty1Data filtered and analyzed by the Social IMPACT Research Center, from the U.S. Census Bureau’s American Community Survey. 1,621,508 Illinoisans were living at or below the poverty threshold in 2017. Roughly 513,000 Chicagoans were living at or below the poverty threshold in 2016. Chicago Community Area Poverty2Data filtered and analyzed by the Social IMPACT Research Center, from the U.S. Census Bureau’s 2015 American Community Survey 1-year estimates. 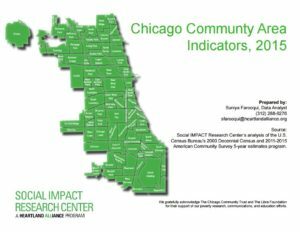 The Socia l IMPACT Research Center reports individual poverty rates for Chicago neighborhoods in its report Chicago Community Area Indicators. Also in the report are estimates of Chicagoans living in extreme poverty (50% of Federal Poverty Threshold or below) and low-income conditions (200% of FPL threshold or below).3Information based on Social IMPACT’s analysis of the 2008-2012 5-year estimate from the Census Bureau’s American Community Survey. Illinois City Poverty4Data from 2015-2016 1-year estimate of the Census Bureau’s American Community Survey, available from the American FactFinder. Data is not available for 2016-2017. To obtain data for shorter time frames (such as one-year estimates) visit the American Community Survey FactFinder. The FactFinder is a resource of the U.S. Census Bureau, providing demographic, economic, social, housing and other pertinent information for over 7,000 different geographic areas nationwide.5For more information about the FactFinder, as well as instructions for using it, read the WIRE’s Guide to the FactFinder. In January 2014, the New York Times released the map to the left–a detailed map of poverty rates across the United States. The map shows poverty by county and by census tract (the smallest geographic area used by the Census Bureau).6Based on 2012 US Census data. Every year, the Working Poor- Families Project analyzes U.S. Census data to collect key indicators about working poor and low-income families in every state. Following are select figures from this dataset, which can be found in its entirety here. Project, 2017, Chapter 1, Table 1.A.1b. In the United States 34.9% of poor families are working.8Working Poor Families Project, 2017, Chapter 1, Table 1.A.1b. The Working Poor Families Project defines terms and explains source data extensively in its Framework of Indicators. Family: Primary married couple or single parent family with at least one child under age 18. Working Family: A family where all family members age 15 and over have a combined work effort of 39 or more weeks in the last 12 months or all family members age 15 and over have a combined work effort of 26 or more weeks in the last 12 months and one currently unemployed parent looked for work in the previous four weeks. The federal government defines family income as based on all family members age 15 and over. Poor families are those that fall below 100% of the poverty threshold set by the Census Bureau. Family in Poverty (Poor Family): A family with an income below the threshold for poverty as defined by the U.S. Census Bureau. Low-Income Family: A family whose income is below 200% of the poverty threshold. 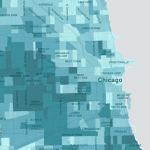 The City of Chicago’s Data Portal provides household poverty rates by neighborhood, in contrast to the individual poverty rates filtered by the Social IMPACT research center, provided above on this page. The estimates below are made by the U.S. Census Bureau. These estimates determine poverty status using thresholds, which are determined by estimating the cost of family needs. The annual income of the family is then compared to these thresholds. The thresholds vary based on family size, number of children, and age of householder and are updated annually. Thresholds do not vary geographically. Poverty guidelines are more often used for administrative purposes, such as determining financial eligibility for Medicaid and the Children’s Health Insurance Program. Though often confused with thresholds, they are slightly different measures. They are issued each year by the U.S. Department of Health and Human Services. The poverty guidelines for 2018 are as follows:11Here is the full chart of poverty guidelines for 2018, as well as historic poverty guidelines. For more on measuring poverty, see the US Census Bureau’s main Poverty Page, or check out the Income and Poverty In the United States: 2016 Report. What does the poverty rate miss? The poverty rate doesn’t necessarily capture what it means to be able to fulfill basic needs in different areas across the country, nor make meaningful investments in education, retirement, or healthcare. To explore what a living wage looks like, look at our self-sufficiency page. The key elements of the SPM are measuring cash income, benefit programs, tax credits, and expenditures on basic needs. The SPM takes into account how anti-poverty programs reduce poverty, which the OPM does not. The SPM is also much more current than the OPM: OPM’s measurement of the poverty threshold is partially based on food costs from 1963! 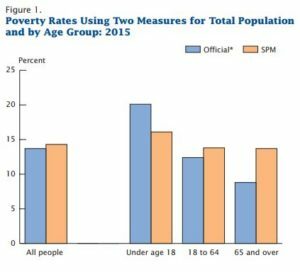 Disaggregating data for measurements of the SPM helps show how different policy choices, such as CHIP or Social Security, can shape poverty. Also, given different costs and employability for different populations, the poverty measure will vary. See the graph below for more information. In the 1990s, the National Academy of Sciences recommended that the poverty measure be a threshold to afford basic needs such as food, clothing, and shelter counting cash and noncash resources and varying by location. With the NAS measure, poverty thresholds and rates are higher than the current Federal measurement nationwide, with a decrease in extreme poverty. 1. ￪ Data filtered and analyzed by the Social IMPACT Research Center, from the U.S. Census Bureau’s American Community Survey. 2. ￪ Data filtered and analyzed by the Social IMPACT Research Center, from the U.S. Census Bureau’s 2015 American Community Survey 1-year estimates. 3. ￪ Information based on Social IMPACT’s analysis of the 2008-2012 5-year estimate from the Census Bureau’s American Community Survey. 4. ￪ Data from 2015-2016 1-year estimate of the Census Bureau’s American Community Survey, available from the American FactFinder. Data is not available for 2016-2017. 5. ￪ For more information about the FactFinder, as well as instructions for using it, read the WIRE’s Guide to the FactFinder. 6. ￪ Based on 2012 US Census data. 8. ￪ Working Poor Families Project, 2017, Chapter 1, Table 1.A.1b. 11. ￪ Here is the full chart of poverty guidelines for 2018, as well as historic poverty guidelines.